When it comes to gutter installation services in the Perry Hall, Maryland, area, finding a company that offers great products is a must. 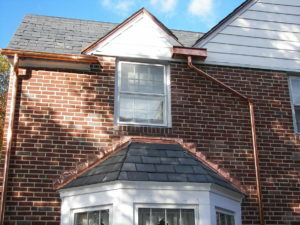 But beyond just top-quality gutters, you want the company you choose to offer customer service that is second to none. For that, you can simply turn to Roland Slate Service Company. As a family-run company, we are able to provide a personal touch with our gutter installation services that many of our competitors simply can’t match. Perhaps best of all, you will rest easy knowing that you have purchased a product that is not only highly durable but also backed by a comprehensive material warranty from the manufacturer. What’s more, we support the brilliant work of our gutter installation technicians with a labor warranty to boot, giving you the ultimate peace of mind. To learn more about why so many Perry Hall, MD, area residents choose us for all of their gutter installation needs, contact Roland Slate Service today. We will happily provide you with a complimentary consultation at your earliest convenience.